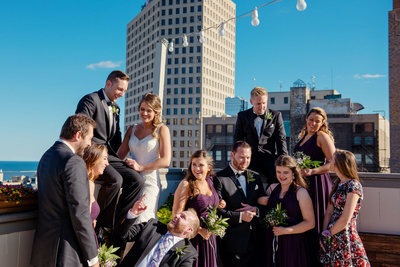 Surround your wedding and reception with stunning, panoramic views of Lake Michigan, Lake Park and Milwaukee’s cityscape. Located directly on the lake adjacent to the art museum the Milwaukee War Memorial Center has been a lakefront landmark since it’s dedication in 1957. The buildings unique design is considered a classic in the development of modern architecture. THE WEDDING: The images in this review were taken at a wedding we photographed in September. It was a beautiful day with billowing clouds with the sun peeking through occasionally. White wooden chairs were set up for the guests with an archway serving as the focal point for the vows. Decorations are simple taking nothing away from the amazing view all around. Cocktail hour began right after the ceremony and was situated in the courtyard on the plaza. The DJ had set up, the atmosphere was festive, the guests mingled, everyone had a good time. We gathered the wedding party together for a walk to the art museum taking pictures along the way. Later the reception moved indoors into the Memorial Hall for dinner and dancing. The evening went without a hitch and we so enjoyed covering Sarah and Micheal’s wedding. Before I continue here are a few pictures of the venue for you to enjoy. Scroll down past the images for the rest of the review. THE VENUE: The War Memorial Center can host wedding ceremonies as well as receptions. Ceremonies are generally held outdoors on Fitch Plaza and can accommodate up to 1200 people. In the event of rain they venue has 2 backup locations! There is a large covered outdoor area available or you can move the ceremony indoors free of charge. Either way would be a great option, although if possible, I would suggest choosing the plaza’s covered area which allows your guest to enjoy views of the lakefront and the art museum next door. After the ceremony there is plenty of room on the plaza to host a cocktail hour before moving into the Memorial Hall for the reception. The Memorial Hall is a fantastic venue for your reception. It features tall ceilings above, wood floors under foot and a stunning row of floor to ceiling windows with excellent views of Milwaukee’s urban center. It can accommodate up to 260 for dinner and dance. The staff were fantastic and all were professional and courteous. Our bride reported the staff event planner was very helpful in planning and setting up of decorations, catering and entertainment. BOTTOM LINE: For the couple looking for a scenic outdoor venue in the city the Milwaukee War Memorial Center should be on the short list. It’s modern mid-century architecture may not be for everyone. However, the breathtaking, expansive views of both the lake and downtown may just win you over. 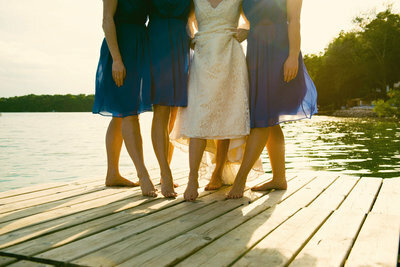 It is certainly worth a look and would serve as a dramatic backdrop for your perfect wedding day. PHOTOGRAPHER’S NOTES: The war memorial is a wonderful venue to photograph with excellent possibilities all around. ceremonies on the plaza have a wonderful view of the lake as a backdrop and moving around the subject you can catch the Lake Park kites and the art museums “sail”. No real tricks to photographing a wedding at this venue. However, as with any outdoor wedding prepare for bad weather and as always be sure to scope out the venue ahead of time to plan your shots. Vender Information: If you are interested in having your wedding at the Milwaukee War Memorial Center contact their event planning staff at 414-273-5533. They also post their rates and a list of approved vendors on their website. If you are looking for a photographer contact us at 262.573.9055 or use our contact form. 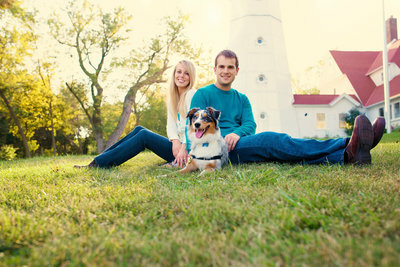 Realife Photography’s award winning photographers were voted Milwaukee’s best in 2011 and placed 2nd in 2012 on WISN’s The A-List. 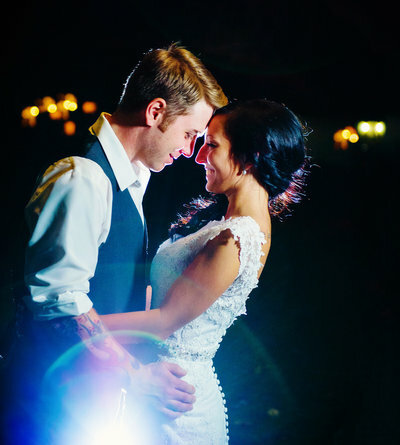 Be assured your wedding is covered by one of the regions best photographers. Sarah and Micheal’s War Memorial wedding. About Our Venue Reviews: Our task as wedding photographers is to capture our clients wedding in artistic and beautiful ways. 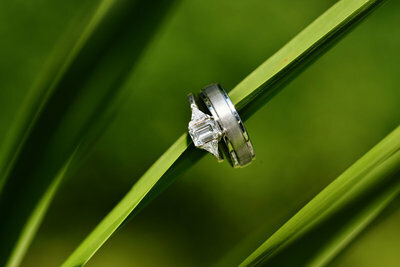 Choosing the right venue is one of the biggest decisions a bride/groom will make when planning their wedding. 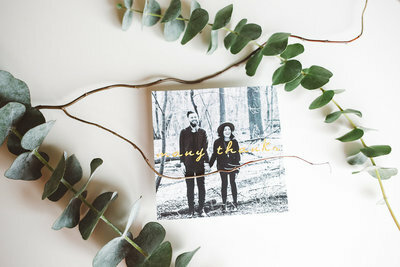 Our hope is to shine a light on some of the unique and beautiful wedding venues in the Milwaukee area and hopefully help aid you in this choice. As a side benefit, this review is written from a photographers perspective and should be helpful to other photographers . Be sure to check out our “photographers notes” at the end of the post for tips and hints for photographers.